Australia’s premier young female cricketers would again swelter in the heat of country Victoria as the 2019 under 18 championships continued. With plenty of big hits and close encounters, it was an intriguing days play as the ladder begins to take shape heading into the finals. In the evening match of round two, Victoria Metro cruised to a 48 run win over Tasmania. Led by openers Tess Flintoff and Katia Jomini, Metro would post a solid first innings total of 118 to get ahead of the game early. Flintoff in particular was superb, as the big hitting opener smashed 60 off 55 in the top batting performance of the days plays. Jomini would prove excellent support at the top of the order as she contributed 33 to a brilliant opening partnership of 89. Amy Rose Duggan was the pick of the bowlers for Tasmania, with her figures of 3-15 pivotal in restricting a potential monster Victoria Metro total. In response, Tasmania’s chase never got going as a clinical bowling performance saw Victoria Country claim a convincing victory. Erika Quinn was the standout bowler with figures of 3-11, with the remainder of the attack supporting her brilliantly. 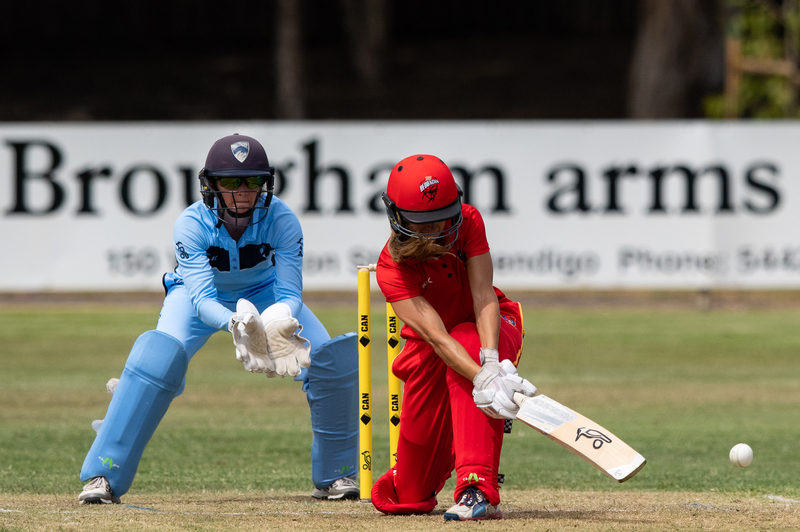 Alise Genford was the standout performer of round three, as the all rounder piled on 36 and took 4-10 as NSW Metro cruised to a 59 run win to remain undefeated. In a battle of two of the strongest teams from day one, NSW Metro would get off to a shaky start with the bat as three early wickets would see them struggling at 3-33. This would bring Genford to the crease, as she effectively managed to stabilise the innings and set up her team for a big finish. Supported well by the power hitting of Maddy Darke (35), the pair would put on 39 for the fourth wicket to swing the momentum back in Metro’s favour. Darcie Brown would be the pick of the bowlers for South Australia, with the opener picking up 2-15 from her four overs as NSW Metro managed to get a respectable total of 7-120. Looking to keep their undefeated record in tact, it was a disastrous chase for South Australia from the outset as NSW Metro put in one of the best bowling performances of the tournament thus far. Genford would prove particularly hard to get away, with her four wickets tearing the heart of the South Australian’s batting lineup. Isabelle Arafas also continued her day one heroics, claiming excellent figures of 2-2 from her three overs. Victoria Country claimed a thrilling victory over the CA XI in a low scoring match at Weerona Oval. Madeleine Jones was the standout with ball in hand for the CA XI, with her figures of 3-10 pivotal in restricting the Country batsman. With the bat, Victoria Country captain Jaide Anthony would provide the only resistance with a patient 18 off 27 as they managed to just survive the 20 overs with a score of 75. Chasing a lowly 76 for victory, the Cricket Australia XI would be inflicted with some crushing early blows as the Victoria Country bowlers put in a mighty effort. Madeline Jones would lead the way with ball in hand for Country, claiming figures of 3-10 as the CA XI could not cope with he excellent line and length. In a run chase full of drama, the CA XI would provide one final push at victory, with tailender Emily Hinze’s late innings heroics not quite enough with a run out from the second last ball seeing Victoria Country win by one solitary run. ACT/NSW Country suffered their first loss of the tournament in a high scoring encounter against Queensland at Queen Elizabeth Oval. Batting first, the ACT/NSW Country middle order would form the backbone of a solid first innings total of 136. Anika Learoyd (36), Anita Handono (34) and Jessica Davidson (35*) were all excellent for country as they punished the wayward bowling of the Queenslanders. Opener Emily Vallance was the pick of the bowlers for Queensland taking 1-17 from her three overs, with sundries proving to be a major problem for the majority of the bowlers. With lots of work to do, the Queensland big hitters were in fine form as they managed to chase down Country’s total in dramatic fashion. Led by all rounder Courtney Sippel (42) and captain Annie Wilkman, Queensland proved why they possess some of the strongest batting the tournament has to offer. Requiring six off the final over for victory, it would be a nail biting finish as the poise of R Irvine got the Queenslander’s over the line. Victoria Metro put in a solid all round performance as they claimed a convincing 25 run win over Northern Territory. After losing both openers in the early stages, Metro would rely heavily on their middle order as Hailey Ferris, Caitlin Morando and Jessica Matin all passed 20 to help build a respectable total to defend. Jessica Bradley was the pick of the bowlers for the Northern Territory, picking up figures of 3-29. Forced to chase down 113, the Northern Territory chase never got going with every batsman bar one managing to make it into double digits. Ruby Strange would be the only Northern Territory to make any impact on the chase, with her 41 off 37 a gallant effort in the defeat. With ball in hand, Olivia Thomas would be the standout for Victoria Metro as the opener claimed figures of 3-14 in a quality display of fast bowling. Western Australia opened their account with a tight win over Tasmania at Dower Park. In a low scoring encounter, Tasmania would surrender a solid start by opener Chloe Abel (28) as a middle order collapse of 6-39 saw them fail to top the hundred mark as they posted a total 94. Looking for their first win of the tournament, it would be a shaky start for the Western Australians as early wickets saw them slump to 4-35. Opener Sophie Parkin would inflict the early damage for Tasmania, as she troubled the top order with figures of 2-15. This would set the game up for all rounder Emma Meuleman to be the hero, as the number seven produced a classy 32 off 35 to see her side home to a much needed victory. NSW Metro extended its winning run to four matches with a comfortable seven wicket victory against ACT/NSW Country. ACT/NSW Country posted a competitive 9/128 thanks to good contributions from Alisha Bates (37) and Lara Graham (30), with NSW Metro bowler Hannah Darlington claiming 2-7 off fours overs and showing her all-round ability having posted a half-century with the bat on day one. Darlington (1) fell cheaply at the top of the order as her side set about chasing down the target, however fellow opener Maddy Darke (59*) took control of the innings. Middle order batters Angelina Genford (21) and Olivia Porter (25) also chipped in to help their side reach the target in the 17th over. Victoria Metro also had the perfect day, making it two wins from as many matches thanks to a 24-run victory over Western Australia. Openers Lucy Cripps (48) and Merinda Hale (33) combined beautifully to take the score to 76 before the latter was dismissed. No other batters were able to reach double figures though as WA's bowlers pegged back the scoring, Samantha Quadrio the pick of the bowlers with 2-12. It was a similar case for WA with only two batters reaching double figures, Metro's bowlers giving little away with the ball and making their opposition work hard for their runs. Letesha Bawden claimed 3-13 in her first match of the Championships, while Tiana Atkinson (2-16) was also impressive; the duo ensuring a steady flow of wickets meant WA could only manage 9/84 from its 20 overs, 25 runs short of victory. After winning the toss and electing to bat in its afternoon match, Tasmania never looked back against the Northern Territory, cruising to a 49-run win. Tasmania's top-order was in fine form, non more so that Bonnie Davies who posted an unbeaten 55 off 49 to anchor her sides' innings. A flurry of late wickets helped stem the flow of runs, with NT bowlers Gillian Chalmers (2-24), Amber Cloughessy (2-22) and Rachel Hartung (2-16) doing the bulk of the damage. In reply the NT never really got going with the bat, with only three players reaching double figures. Cloughessy (26) did her best to keep her side in the match but a steady flow of wickets made the going tough, NT reaching 9/77 at the close of innings. In a much closer match, South Australia proved too good for the Cricket Australia XI, running away with a narrow 10-run win. Rachel Chruch's unbeaten 48 was the highlight for SA who posted 5/125 from its 20 overs, opener Katie Rowe (25) also in good form with the bat. In reply the CA XI looked like it might sneak home to claim the win with a number of batters making good contributions, but a late flurry of wickets proved the difference. Medium-pace bowler Laura Niejalke finished the match with three wickets for SA, while Sophie Roberts and Steph Beazleigh both claimed two wickets. In the final match of the day it was Queensland who took the points against the Victoria Metro side, claiming the win by 63 runs. Having posted a strong total of 9/146, Queensland set about defending its total but soon had a battle on its hands with the Metro side reaching 64 for the loss of just three wickets. Unfortunately for the Victorians that was the end of the good news, losing a remarkable 7-19 to eventually be bowled out for just 83. The wickets were shared by the Victorian bowlers, with Ellie Johnston (2-9) and Neve Lynch (2-20) the only multiple wicket-takers.